A Bas-Armagnac with a slightly confusing label. 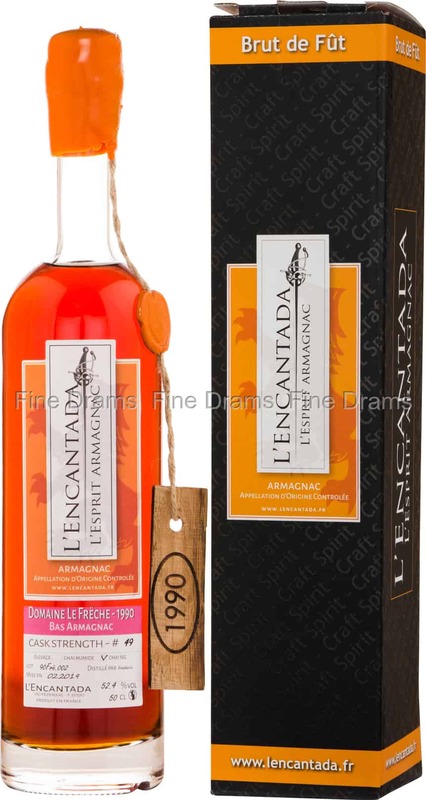 L’Encantada state that this bottling comes from Domaine le Frêche, however le Frêche is a region with many producers, so it is unsure where exactly this spirit is produced. What is certain, however, is that this is an absolutely delicious Armagnac, picked and bottled by L’Encantada, who have an enviable reputation for choosing the best Armagnac casks around. This particular single cask bottling was distilled in 1990, and aged for around 29 years in French oak casks. This bottling offers notes of rich ripe grapes, oak, hazelnuts, caramel, chocolate, citrus peel, a touch of cola, cinnamon and cloves. Bottled at a generous cask strength of 52.4% ABV, this is an Armagnac full of character.